were sustained to utility infrastructure. Emergency Operations partners will be analyzing the evacuation process and thresholds for this event. Emergency Operations will use this information to make decisions for future rain debris. 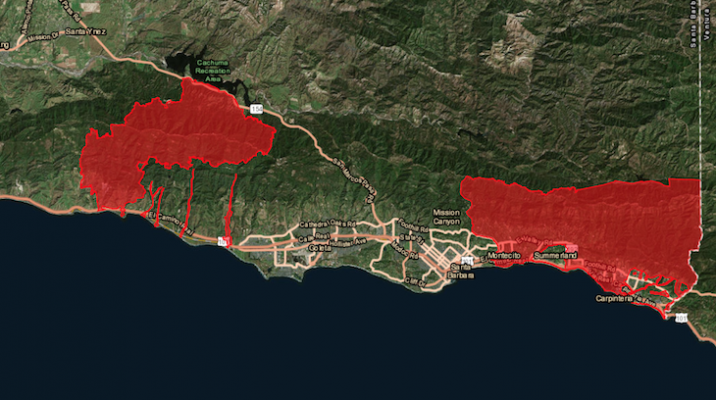 The Recommended Evacuation Warning remains in place for the Thomas, Whittier and Sherpa Fire burn areas along the Santa Barbara County south coast (in Goleta, Santa Barbara, Montecito, Summerland and Carpinteria). A Flash Flood Watch has been issued for these areas beginning at 9 p.m. tomorrow, Thursday, March 1 to 9 a.m. Friday, March 2. The current forecast from the National Weather Service indicates that the heaviest rainfall is now predicted to arrive around midnight Thursday and will continue for a 6-hour period into Friday. Total expected rainfall for this storm is 1 inch for the coastal areas and 1.5 to 3 inches for the foothills and mountains. Rain intensities are predicted to be between 0.33 inches and 0.5 inches per hour. The threshold for a debris flow is 0.5 inches per hour or greater. Therefore, no Mandatory Evacuation Order is being issued tonight (Wednesday Feb. 28, 2018). Public safety officials are continuously evaluating weather predictions and may issue a Mandatory Evacuation Order tomorrow morning (Thursday, March 1) if warranted. At rainfall rates of 0.33 to 0.5 inches per hour, people near streams and channels could be threatened by debris flows. School districts will contact families through their established communication channels regarding any possible school closures. Community members are encouraged to go to ReadySBC.org for up-to-date information on evacuations and road closures. An evacuation boundaries map is now available at ReadySBC.org which shows communities near or below the Thomas, Sherpa and Whittier Fire burn areas that are under the Recommended Evacuation Warning currently in effect. This map will be updated to reflect any changes to evacuations. Additional evacuation information will be provided by 6 p.m. today (Wednesday, Feb. 28). The National Weather Service predicts that a storm arriving Thursday night and continuing through Friday will have rainfall in the range of 1/3 to 2/3 of an inch per hour. NWS informed the County that moderate to heavy rainfall rates early Friday may be enough to generate isolated mud and debris flows near burn areas. The communities near and below the Thomas, Sherpa, and Whittier burn areas are strongly recommended to relocate to safer locations for their own safety. High risk for loss of life and property exists. Additional evacuation information will be provided by 6 p.m. Wednesday, Feb. 28. If a Mandatory Evacuation Order is issued, all persons must be out of the designated areas by Thursday, March 1 at 9 a.m. The location for evacuation centers and animal shelters will be announced Wednesday, Feb. 28. Schools will remain open on Wednesday. School districts will contact individuals through their established communication channels regarding school closures. To determine if you are located near or below one of the burn areas, access the interactive map at ReadySBC.org. 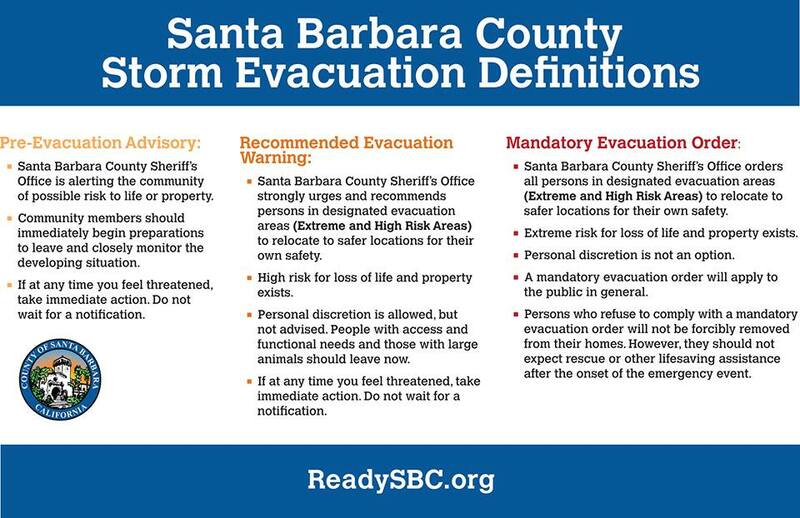 PRE-EVACUATION ADVISORY TO REMAIN IN EFFECT FOR SANTA BARBARA COUNTY. Public Asked to Remain Vigilant of Storm System Arriving Thursday Afternoon. The Pre-Evacuation Advisory issued by County officials for the Sherpa, Whittier, Alamo and Thomas Fire burn areas remains in effect. No evacuations are being ordered for the Monday/Tuesday storm. However, thunderstorms can appear with little to no warning and can cause debris flows. 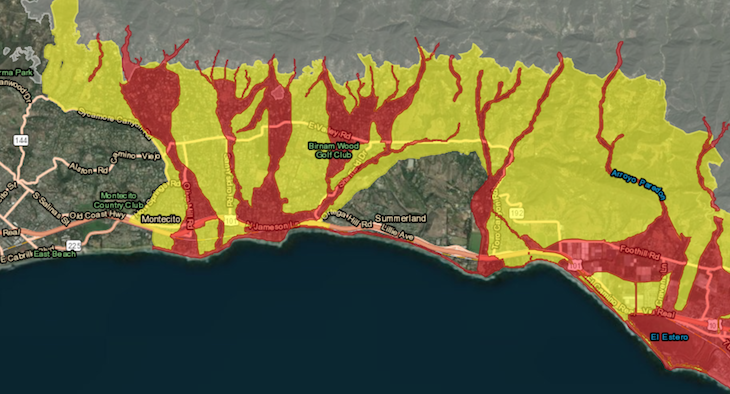 The National Weather Service has updated its forecast for Monday and Tuesday and has reduced the threat of minor debris flows for all burn areas in Santa Barbara County. The threat for minor debris flows is 5% due to possible thunderstorms forecasted in the Tuesday morning hours between 4:00 a.m. and 10:00 a.m. Clean-up efforts in our debris basins have now improved capacity for minor debris flows. The Pre-Evacuation Advisory will remain in effect as the prediction for the storm on Thursday may meet evacuation thresholds. The public must remain vigilant as flash floods, mud and debris flows can happen with little or no warning. County agencies, emergency officials and NWS will continue to monitor the situation and provide updates as needed. Unstable Storm Expected in the Area Monday Night Through Tuesday Morning: A Pre-Evacuation Advisory has been issued for the Sherpa, Whittier, Thomas and Alamo Fire burn areas due to an approaching winter storm. If at any time during this storm, or any storm, anyone feels threatened, action should be taken to leave for high ground or a safe area. Do not wait for a notification. If an individual or family has access or functional needs, or has large animals to move, consider leaving well in advance. For more information on the risk please go to ReadySBC.org. To go directly to the Interactive Debris Flow Risk Areas map, visit ReadySBC.org/StormReadyMap. Please also standby for future updates. It is critical that people in Santa Barbara County register to receive emergency alerts. Sign up at www.AwareAndPrepare.org.If we can’t reach you, we can’t alert you. 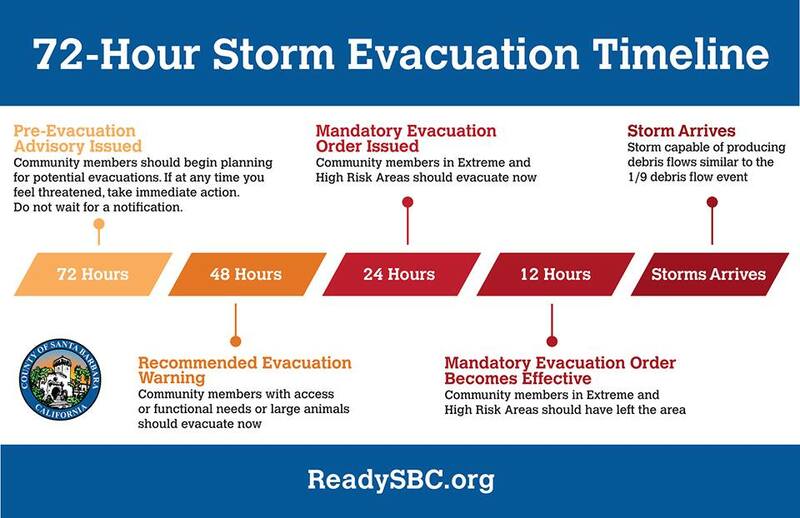 Stay Connected: For ongoing updates, go to www.CountyofSB.org, follow @countyofsb on Twitter and Facebook, or call 2-1-1 from 805 area code or 800-400-1572 outside of 805, or text your zip code to 898-211. Permanece Conectado: Para actualizaciones continuas, ve a www.CountyofSB.org, sigue @countyofsb en Twitter y Facebook o llama al 2-1-1 desde el código de área 805, o al 800-400-1572 para fuera del 805, o manda por texto tu código postal al 898-211. MrTrump, how was the slide you prognosticated in your Feb. 26 comment? Or did you mean that someday Montecito will have another slide? Gotta agree with you on the latter. We can all just be thankful this rain didn't cause much damage, just little overflows in Montecito that I know of. There was plenty of warning, better safe than sorry. In the original flow of 1/9 only about 10-15% of those in the mandatory area left, after deputies knocked on every door. "Flash flood" warnings somehow didn't resonate with people living by a creek, even in the lower areas of Montecito. County Flood Control put lights on the creeks in Montecito to see how water was flowing all night. Thank you for the careful preparations, Jon Frye and Tom Fayram. We all appreciate your hard work to keep us safe! A light steady rainfall helped our gardens but didn't create a 1/9 debris flow emergency...this time. 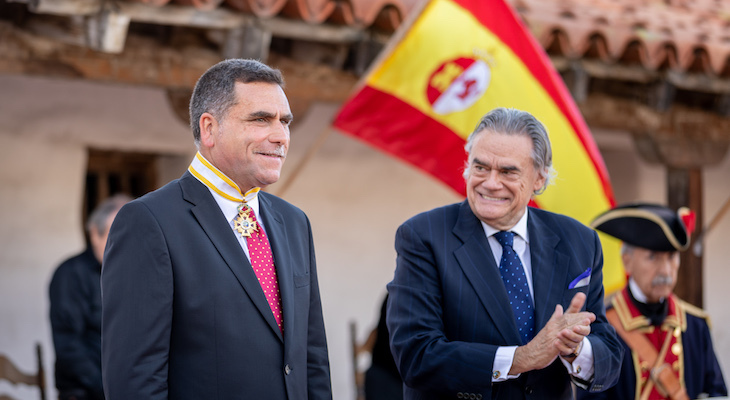 Thank you to all County of S.B. workers, and KEYT for keeping us informed all night. Hopefully, KEYT reporters stayed warm during the night as they kept watch for us! Rainfall totals so far are light per the rainfall map from county: https://rain.cosbpw.net/home.php You can select time interval for the storm total. In the past 6 hrs we have 0.91" above Refugio Canyon, 0.54 above Telecote, and up to about 0.30" above parts of Montecito. This "storm" is going to be a bust! Hope it's not a "bust" - we need the water desperately! I mean I'd hate for there to be more mudslides, but that's just a fact that we need to get used to. We still need water. I hate to say it, but I don't think we're getting any rain. It's been pushed back all day. It was supposed to be raining by 10am today. this was a reply to Fitness1... so much for replying to specific posts; it simply does not work. I guess you mean heaviest rain around 2 A.M. ?? I'm sure they want people out while there's still some daylight; people must still be leaving. True, Horsegirl, I'm about 8 miles from danger and the rain woke me at 3 a.m. on that ill-fated morning. It's been drizzling/gently raining by La Cumbre Plaza for 2 hours or more. I hate the downvote function. It's totally frivilous and I wish Edhat would do away with it. Nothing wrong with your comment that I can see. I'll always remember the commenters early on the 9th, saying how they would "believe it when they see it" and had "plenty of beer" at any rate. Ah well. According to the 8km IR animated map for the west which can be linked to the weather links at SBiTZ.net, there is a long arc of moisture out in the Pacific that's been producing rain up north which is slowly working its way down to us. Pay attention to that because that's probably what will soak us later tonight. It actually looks like the bulk of the rain is coming after 8pm & continuing thru the night. Heaviest rainfall around 2pm. Weather.com graphics are good & usually (in my experience, anyway) pretty accurate. Maybe that's why they wanted everyone out by 6? FREE rides to Red Cross at Earl Warren, KEYT website: " Lyft and Uber are offering free rides to and from the Red Cross storm evacuation center at Earl Warren Showgrounds to all residents affected by the mandatory evacuations.To request on Uber, enter the promo code STAYSAFE18 in the payment section of your Uber ride app under "Promotions." The offer is good for one trip up to $40 on uberX and uberXL and it's valid through Sunday, March 4, 2018." To redeem on Lyft, use the promo code SBSTORM in the promotions section of the Lyft app. The offer is good for rides up to $50. Pick-ups or drop-offs must be within the coverage area of Earl Warren Showgrounds. Thank you, Sheriff Brown, for your measured and calm approach to evacuations. What a farce. The mandatory evacuation order should have been issued yesterday. Now, thousands of people, including elderly people, have 6 hours to get out. Once it starts raining, the roads will be slick with mud. Mr. Trump, if after the last catastrophic event these people are still not paying attention, then I truly fear for the human race. To the real bebe @ 12:10 P.M- People don't listen to "advisory" warnings. That's why most of the people killed on January 9 were in the "advisory" evacuation zones. Only mandatory orders are effective. Even then, much of Montecito should be declared uninhabitable, condemned and turned into a large debris catch basin to prevent debris from flowing onto Highway 101. The pre-evacuation warning/advisory was issued on Sunday the 25th, with regular updates each day. You know this for a fact, because you have bee commenting on it ever since. Residents have had almost four days to be proactive in their preparations. If they have been laying around doing nothing in preparation for this possibility, and ignoring four days of warnings, updates and forecasts, then yes, six hours would be a farce. Mandatory evacuation noon today, Thurs. March 1. TWOSCOOPS has it right, everyone should become a member of Edhat. A dollar a week won't break the bank. Good to be supportive of Edhat from all of us who enjoy it. I think they should make all memberships paid to comment and that we should use our real names. That would cut down on the unhelpful comments sometimes seen here. 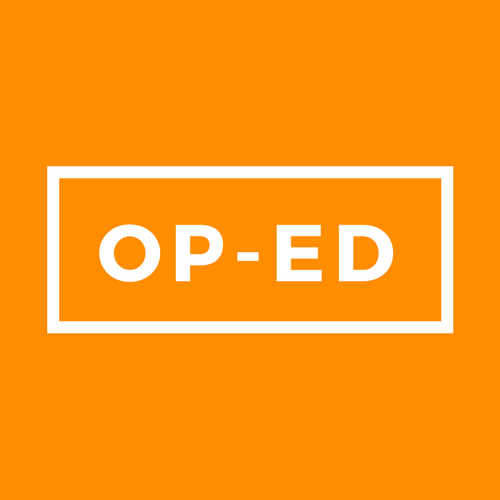 Please support Edhat by paying for a membership. The next few days Edhat will get heavy usage. There are 802 paid memberships. 30,902 total subscribers, that's 2.6%. To send a check, mail to Edhat, P.O. Box 3846, S.B. CA 93130. Presently, the doppler radar for our area and the southwest sector is clear, and the GEOS IR map shows that the rain activity is still far away. You can check them for yourself on the links at SBitZ.net. The real rain starts hitting late tonight and tomorrow. Know your situation if you are in a denuded watershed. We'll probably be doing this drill several times before the rainy season ends. My bad. Based on earlier forecasts I thought the precip would be starting shortly after midnight tonight. No Shasta Guy, there is no rain forecasted for tonight. The forecast is for late tomorrow night (Thursday). Get out now, and get use to this for the next 5-10 years. I just posted another weather link on SBitZ.net for SB Internet natural phenomena resources. I do the same thing Channelfog with the Vandenberg Radar which can be linked to at SBitZ.net. This is all about being informed, and understanding how these things impact your personal situation. Those sets of links help you figure out your own risk. The night before the mudslides I posted that we were getting set up for something like a "Lahar" which is an unstoppable, violent flow of mud water and rocks from a volcanic area. I only wish I had been more forceful in my language. If you have denuded hillside above you, you better understand whether or not if there is a band of strong precipitation coming your way. The Vandenberg Doppler is great for that. I've just organized the links at SBiTZ.net by topic, and they are all cleaned up. All the weather links are first, and you'll figure out the rest. Everyone had great suggestions. I now live just over the county line in SLO County, and we are getting some pretty good rainfall right now! So stay alert everybody! I used to live in Montecito & saw Josie almost every day at the Y. My old neighborhood is mostly washed away. SO heartbreaking on so many levels. Please let's everyone be safe. Let me amend that...it is raining here HARD! 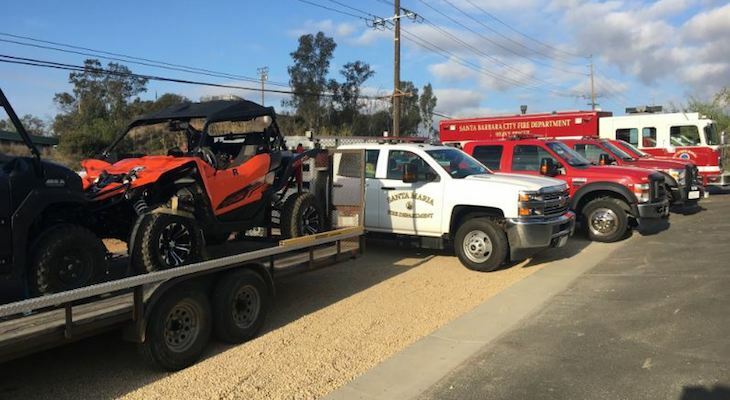 It was concern about being seen as over-protective that caused the Sheriff's office to issue inadequate evac orders in January. There were so many complaints about the length of the Thomas fire evacuation, which, since the firefight was successful, did not appear to be "necessary" in retrospect. That's the problem, when you evacuate and the disaster is successfully forestalled, people think evacuation was unnecessary. 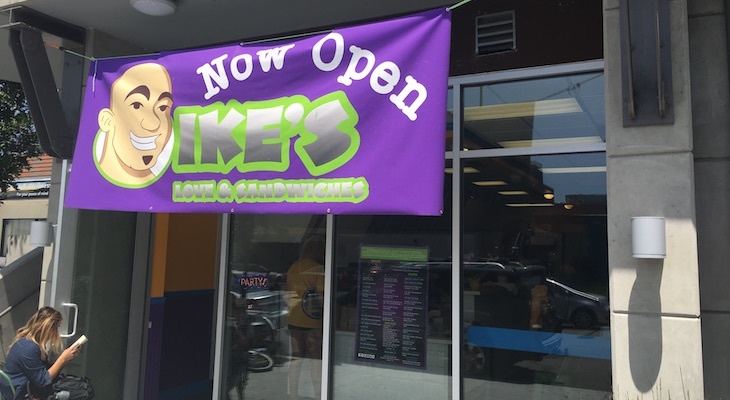 I appreciate they're trying to step up now. The thing is, we all want them to be wrong, right? We would like to find that evacuation was unnecessary, but with the precarious situation of Montecito's hillsides that's not something we can know before the fact. I think we are getting "overprotective, panic laden warnings", as one commenter stated, is because it's better to be safe than sorry. To heck with the "suing" claim of paranoia. People complained about the "lack of warning" about the debris flow, even though there were flash flood warnings a couple days ahead of the 8th-9th. Responding to several comments here: It may be overblown, it sounds so, but get used to it! It'll be this way for several years. Emergency Services (ES) does HAVE to do this to protect the community at risk, and to protect themselves from claims. Remember, ES has a plan to close 101 two hours before a rainstorm. Oh will the stuff hit the fan if that happens! Everybody commenting has valid points. Thanks, CHANNELFOG! I enjoy Doppler Radar and am a details person myself. Based on what I learn from the science at hand such as radar, I can make my own predictions. The County has been on top of this. Lots of good information at the numerous press conferences. KEYT has stepped up, with really much better coverage. Like the rains we no longer receive in SB, this type of response tactic is over-blown. The only reason we're getting over-corrective, panic laden "warnings" is because of pending lawsuits in relation to possible misinformation that lead to loss of life. It won't work. As soon as another non-rain event comes through, right after everyone's been asked to evacuate, it's only going to create a collective ignorance of this cry wolf strategy. Stop with the fear mongering parade. Vandenburg AFB live radar images are the best for seeing what is happening over the next hour or more. One can see the advancing waves of rain and time activities accordingly. We have been able to fit in many short, dry dog walks between rain thanks to this radar. Weather 805 twitter link: https://twitter.com/805Weather. Thank you for this link, SHASTA GUY. SBitZ.net is for people who love lots and lots of detail. Thank you John Wiley for setting it up, and thank you SHASTA GUY for the resources list. We should all learn how to read Doppler radar to make our own informed choices based on radar images of rain in 805. We've got moisture coming in this week. Thanks to the SBC for giving everyone a head's up. If you want to track the weather developments for yourself, go to SBitZ.net and look for the link: Internet Resources for Natural Phenomena Affecting Santa Barbara. What may happen this week may be nothing or it may be disruptive. Those links are tools to help you get info without waiting for someone to tell you. We are wanting to add more links to give more people more decision making power. KEYT live interview by phone this morning Robert Lewin, OEM: "Chance of minor debris flow, trajectory of storm tonight is overland rather than over water, and thus, less total rain. Sand bags are available. Kids should go to school today, but check tomorrow for schools possibly closed. The storm later this week AND next week, too early to say if there will be a pre-evacuation advisory." A much stronger storm is coming in on Thursday. Montecito is facing another slide.